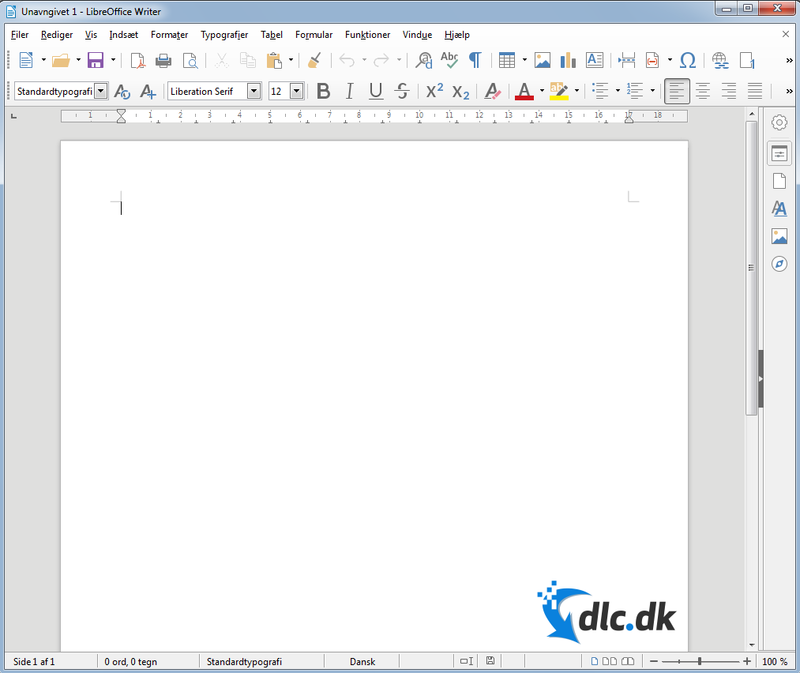 Download LibreOffice (Danish) free here. With LibreOffice, you have all the office applications you need. LibreOffice is a suite of a wide variety of office applications. The package is very similar to alternative office programs such as Microsoft Office Package. Unlike the Microsoft Office suite, LibreOffice is completely free to download and use. In LibreOffice you will find alternative programs for Microsoft's Excel, PowerPoint, Word, OneNote, etc. Of course, there are some different on these two programs, but considering that LibreOffice is completely free, then there are minimal differences. There are many who fear using an alternative to the Microsoft Office Package in fear of not being able to use friends and colleagues' documents. However, there is no need to worry as there is ample opportunity to save LibreOffice files in a format that can easily be opened by Microsoft Office programs. Likewise, you can easily receive files from a Microsoft Office user and open them in LibreOffice. We were unable to find a format that LibreOffice could not co-operate with. The obvious alternative is undoubtedly the Microsoft Office package. LibreOffice was developed to be competitive with Microsoft's office applications, and the program should immediately be an alternative if you do not want or afford to pay for office applications. There are also other free office programs, such as OpenOffice. OpenOffice was the first program developed as a free alternative to the Microsoft Office suite. OpenOffice contains the same alternative office programs as LibreOffice does. In fact, the only difference is that OpenOffice has been longer in the market. However, it is not immediately an advantage, because it seems that the developers behind OpenOffice have lost the passion for further development. LibreOffice is newer on the market and is more frequently updated with OpenOffice. So if you finally had to choose one of the two free Alternatives then LibreOffice might be the best choice. With LibreOffice, you are at any rate immediately future-proof, and thus you risk that you can always open future file formats. LibreOffice has a relatively simple design that is very similar to the typical office programs. That being said, the typical difference in office programs is that some buttons and functions have moved a little. This always requires a little habituation. There are also some shortcut buttons that need to be pressed slightly differently. But in addition to this, the design is simple and easy to find around. The more user-friendly features such as guidance and help are also present, so if you have to deal with problems then there is always help to find. As I said, LibreOffice is frequently updated, giving peace of mind and no fear of future formats that cannot be supported. 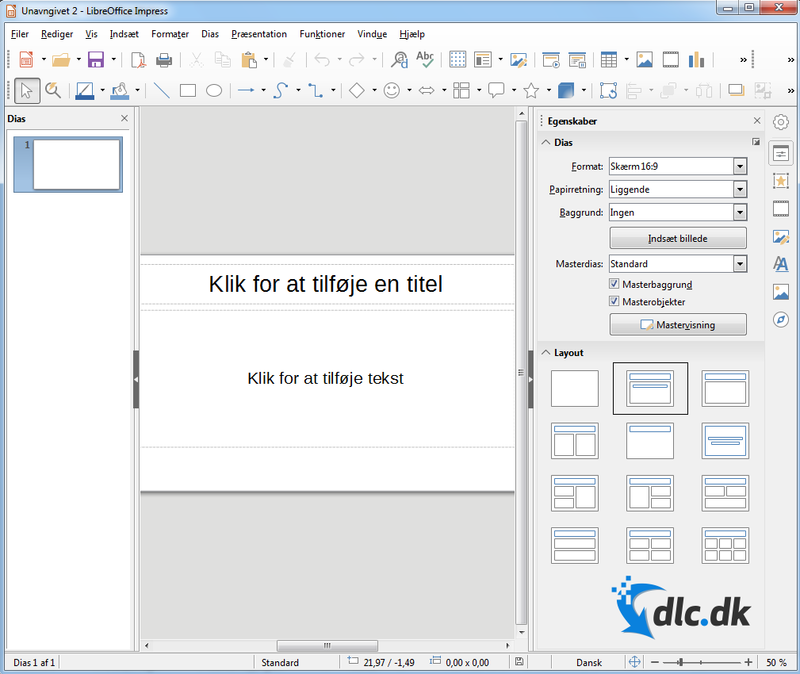 Not only that LibreOffice is frequently updated, various versions and language packages have also been developed for the program. 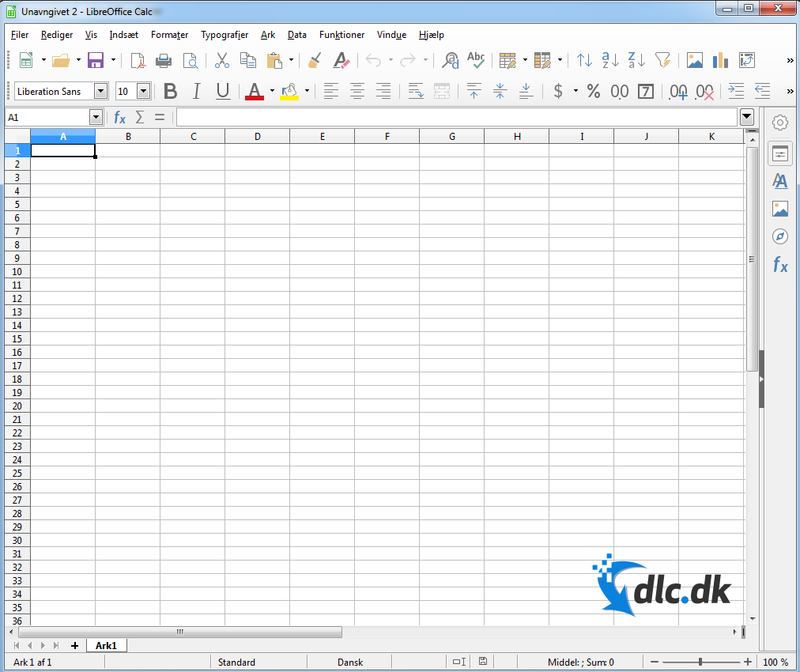 It is the Danish Windows version that you can download here on the page. If you want other language packs or a Mac, Linux version then please use this link. All in all, LibreOffice is a good choice as an alternative solution for office applications. The program is completely free and there are no annoying advertisements that interfere with your use. The Microsoft Office suite undoubtedly contains some strong office applications, but the price has only been increasing since the first release. It is quite understandable that you seek an alternative that can handle it all without having to spend one penny. There should definitely be some adaptation when switching to LibreOffice, especially if you have been used to the Microsoft Office package. The only drawback besides a possible habituation would be if the program could not co-operate with similar programs. Fortunately, LibreOffice can do that. So if you, for example, have the Microsoft Office package on your work computer, then you can easily install LibreOffice on your home computer and continue your work without encountering problems. The great variety of sProg packages are also for us an indication that the developer has some passion for making their program as accessible and user-friendly as possible. We are also quite impressed with how fast LibreOffice is working in. When you have all your office programs installed, they are always lightning fast to open and we found no slightest troubleshooting. And this also applies when you open internal and external files from your hard drive. This surprised us a lot, as we almost had the expectation that an alternative to Microsoft Office would be slower. Besides this, so when you have downloaded LibreOffice from here, it also takes only a few minutes before it is ready for use. 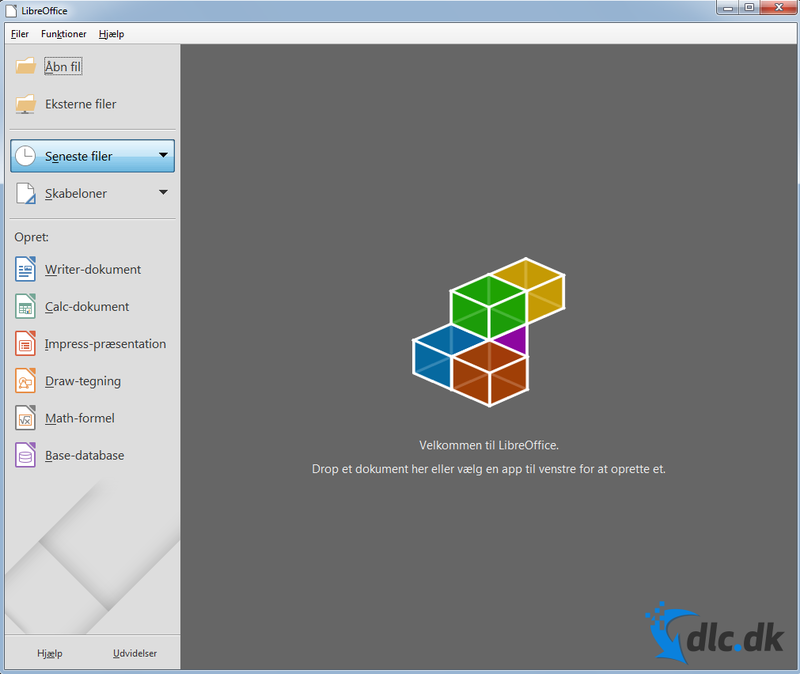 So if you need good alternative office programs then we highly recommend LibreOffice. If LibreOffice is not tempting enough, read our review of the alternative free program OpenOffice right here. The following terms of service and end user license agreement (“EULA”) constitute an agreement between you and THE DOCUMENT FOUNDATION and its affiliates (“THE DOCUMENT FOUNDATION”). This EULA governs your use of Software and Services (as specified below). For purposes of this EULA "Software" means all software programs distributed, published or otherwise made available by THE DOCUMENT FOUNDATION or its affiliates including, but not limited to mobile software, downloadable/installable software for personal computer, and software accessed by means of a browser or other online communication method. Software also includes updates and upgrades as well as accompanying manual(s), packaging and other written, files, electronic or on-line materials or documentation, and any and all copies of such software and its materials. “Services” means all services made available by THE DOCUMENT FOUNDATION, including but not limited to services accessed through mobile games, by means of a browser or by other online communication method. Software and Services are collectively referred to as “THE DOCUMENT FOUNDATION Services”. THE SOFTWARE IS LICENSED, NOT SOLD. YOUR USE OF THE SOFTWARE (AS SPECIFIED BELOW) IS SUBJECT TO THE TERMS AND CONDITIONS SET FORTH IN THIS EULA. BY INSTALLING, USING OR ACCESSING THE THE DOCUMENT FOUNDATION SERVICES OR ANY MATERIALS INCLUDED IN OR WITH THE THE DOCUMENT FOUNDATION SERVICES, YOU HEREBY ACCEPT THE TERMS OF THIS EULA. If you do not accept the terms of this EULA, do not install, use or access the THE DOCUMENT FOUNDATION Services. SOFTWARE LICENSE. Subject to this EULA and its terms and conditions, THE DOCUMENT FOUNDATION hereby grants you a non-exclusive, non-transferable, non-sublicensable, limited right and license to use one copy of the Software for your personal non-commercial use on a single computer or gaming unit, unless otherwise specified in the Software documentation. The rights granted herein are subject to your compliance with this EULA. The Software is being licensed to you and you hereby acknowledge that no title or ownership in the Software is being transferred or assigned and this EULA is not to be construed as a sale of any rights in the Software. SERVICE LICENSE. Subject to this EULA and its terms and conditions, THE DOCUMENT FOUNDATION hereby grants you a non-exclusive, non-transferable, non-sublicensable, limited right and license to use the Services as provided by THE DOCUMENT FOUNDATION, for your personal non-commercial use, in the manner permitted by this EULA. The rights granted herein are subject to your compliance with this EULA. LICENSE TERM. The term of your licenses under this EULA shall commence on the date that you accept this EULA and install or otherwise use the Software and/or Services and ends on the earlier date of either your disposal of the Software and/or Services or THE DOCUMENT FOUNDATION's termination of this EULA. Your license terminates immediately if you attempt to circumvent any technical protection measures used in connection with the Software and/or Services or you otherwise use the Software and/or Services in breach of the terms of this EULA. OWNERSHIP; NO OTHER LICENSES. THE DOCUMENT FOUNDATION retains all right, title and interest in and to the THE DOCUMENT FOUNDATION Services, including, but not limited to, all copyrights, trademarks, trade secrets, trade names, proprietary rights, patents, titles, computer codes, audiovisual effects, themes, characters, character names, stories, dialog, settings, artwork, sound effects, musical works, and moral rights whether registered or not and all applications thereof. The THE DOCUMENT FOUNDATION Services are protected by applicable laws and treaties throughout the world. Unless expressly authorized by mandatory legislation, the THE DOCUMENT FOUNDATION Services may not be copied, reproduced or distributed in any manner or medium, in whole or in part, without prior written consent from THE DOCUMENT FOUNDATION. All rights not expressly granted to you herein are reserved by THE DOCUMENT FOUNDATION. THE DOCUMENT FOUNDATION Services may include links to third party services and/or the third party services may be made available to you via THE DOCUMENT FOUNDATION Services. These services may include, but are not limited to gameplay recording and sharing, social medial connectivity and the like. These services are subject to respective third party terms and conditions. Please study these third party terms and conditions carefully as they constitute an agreement between you and the applicable third party service provider. You agree not to: (i) commercially exploit the THE DOCUMENT FOUNDATION Services; (ii) distribute, lease, license, sell, rent, lend, convey or otherwise transfer or assign the THE DOCUMENT FOUNDATION Services, any copies thereof, or any passwords or usernames of THE DOCUMENT FOUNDATION Services, without the express prior written consent of THE DOCUMENT FOUNDATION or as set forth in this EULA; (iii) make a copy of the THE DOCUMENT FOUNDATION Services or any part thereof, including but not limited to Software (other than as set forth herein); (iv) make the THE DOCUMENT FOUNDATION Services publicly available or available on a network for use or download by multiple users; (v) except as otherwise specifically provided by the THE DOCUMENT FOUNDATION Services or this EULA, use or install the THE DOCUMENT FOUNDATION Services (or permit others to do same) on a network, for on-line use, or on more than one computer or gaming unit at the same time; (vi) use or copy the THE DOCUMENT FOUNDATION Services at a computer gaming center or any other location-based site; provided, that THE DOCUMENT FOUNDATION may offer you a separate site license agreement to make the THE DOCUMENT FOUNDATION Services available for commercial use; (vii) reverse engineer, decompile, disassemble, translate, prepare derivative works based on or otherwise modify the THE DOCUMENT FOUNDATION Services, in whole or in part; (viii) remove, obscure or modify any copyright, trademark or other proprietary rights notices, marks or labels contained on or within the THE DOCUMENT FOUNDATION Services, falsify or delete any author attributions, legal notices or other labels of the origin or source of the material; (ix) misrepresent the source of ownership of the THE DOCUMENT FOUNDATION Services; (x) transport, export or re-export (directly or indirectly) into any country forbidden to receive such THE DOCUMENT FOUNDATION Services by any U.S. or other export laws or accompanying regulations or otherwise violate such laws or regulations, that may be amended from time to time; or (xi) scrape, build databases or otherwise create permanent copies of content returned from the THE DOCUMENT FOUNDATION Services. The THE DOCUMENT FOUNDATION Services may include measures to control access to the THE DOCUMENT FOUNDATION Service, prevent unauthorized copies, or otherwise attempt to prevent anyone from exceeding the limited rights and licenses granted under this EULA. Only THE DOCUMENT FOUNDATION Services subject to a valid license can be used to access online services, and download updates and patches. You may not interfere with such access control measures or attempt to disable or circumvent such security features. If you disable or otherwise tamper with the technical protection measures, the THE DOCUMENT FOUNDATION Services will not function properly. The THE DOCUMENT FOUNDATION Services may allow you to create content, including but not limited to gameplay maps, screenshots or a video of your game play. In exchange for use of the THE DOCUMENT FOUNDATION Services, and to the extent that your contributions through use of the THE DOCUMENT FOUNDATION Services give rise to any copyright, design right or any other intellectual or industrial property right you hereby grant THE DOCUMENT FOUNDATION an exclusive, royalty-free, perpetual, irrevocable, fully transferable and sub-licensable worldwide right and license to use your contributions in any way and for any purpose including, but not limited to the rights to reproduce, copy, adapt, modify, perform, display, publish, broadcast, transmit, or otherwise communicate to the public by any means whether now known or unknown and distribute your contributions without any further notice or compensation to you of any kind for the whole duration of protection granted to intellectual and industrial property rights by applicable laws and international conventions. If not expressly prohibited by mandatory legislation, you hereby waive any moral rights of paternity, publication, reputation, or attribution with respect to THE DOCUMENT FOUNDATION's and other players' use and enjoyment of such assets in connection with the THE DOCUMENT FOUNDATION Services and related goods and services under applicable law. This license grant to THE DOCUMENT FOUNDATION, and the above waiver of any applicable moral rights, survives any termination of this EULA. The THE DOCUMENT FOUNDATION Services may require an internet connection to access the THE DOCUMENT FOUNDATION Services or its internet-based features, authenticate the Software, or perform other functions. In order for certain features of the THE DOCUMENT FOUNDATION Services to operate properly, you may be required to have and maintain (a) an adequate internet connection and/or (b) a valid and active account with an online service as set forth in the documentation related to THE DOCUMENT FOUNDATION Services. By using the THE DOCUMENT FOUNDATION Services, you acknowledge and agree that third party data transfer fees may apply depending on your data plan. Please consult your carrier for further information. If you do not maintain such accounts, then the THE DOCUMENT FOUNDATION Services or certain features of the THE DOCUMENT FOUNDATION Services may not operate or may cease to function properly, either in whole or in part. By installing, accessing or using the THE DOCUMENT FOUNDATION Services, you consent to these information collection and usage terms, including (where applicable) the transfer of data into a country outside of the European Union and/or the European Economic Area or the United States of America. THE DOCUMENT FOUNDATION may license to you certain virtual goods to be used within THE DOCUMENT FOUNDATION Services. Unless otherwise specified, these virtual goods shall be deemed an integral part of the Software. These virtual goods may be licensed both for a fee using “real world money” and without any separate fee, as applicable from time to time. These virtual goods may also be licensed by using third party virtual currency, such as Facebook Credits or by using separate activation codes. Please note that any payment for licenses for virtual goods or redemption of third party virtual currency is always FINAL AND NON-REFUNDABLE. Also please note that if you purchase Facebook Credits from Facebook, such transaction is governed by the agreement between you and Facebook and THE DOCUMENT FOUNDATION is not a party to the transaction. THE DOCUMENT FOUNDATION may manage, regulate, control, modify or eliminate virtual goods at any time, with or without notice. THE DOCUMENT FOUNDATION shall have no liability to you or any third party in the event that THE DOCUMENT FOUNDATION exercises any such rights. SUBJECT TO MANDATORY LEGISLATION, YOU ACKNOWLEDGE THAT THE DOCUMENT FOUNDATION IS NOT REQUIRED TO PROVIDE A REFUND FOR VIRTUAL GOODS FOR ANY REASON, AND THAT YOU WILL NOT RECEIVE MONEY OR OTHER COMPENSATION FOR UNUSED VIRTUAL GOODS, WHETHER YOUR LOSS OF LICENSE UNDER THIS EULA WAS VOLUNTARY OR INVOLUNTARY. THE DOCUMENT FOUNDATION warrants to you (if you are the initial and original purchaser of the Software) that, to the extent the Software is made available to you on a physical storage medium, the original storage medium holding the Software is free from defects in material and workmanship under normal use and service for 90 days from the date of purchase. If mandatory legislation in your jurisdiction requires longer in excess to the aforementioned 90 days, the length of the warranty is amended accordingly. If for any reason you find a defect in the physical storage medium during the warranty period, THE DOCUMENT FOUNDATION agrees to replace, free of charge, any physical storage medium and related Software discovered to be defective within the warranty period as long as the Software is currently commercially distributed by THE DOCUMENT FOUNDATION. If the Software is no longer available, THE DOCUMENT FOUNDATION retains the right to substitute a similar piece of Software of equal or greater value. This warranty is limited to the physical storage medium and the Software as originally provided by THE DOCUMENT FOUNDATION and is not applicable to normal wear and tear. This warranty shall not be applicable and shall be void if the defect has arisen through abuse, mistreatment, or neglect. Any implied warranties prescribed by statute are expressly limited to the warranty period described above. When returning the Software subject to the limited warranty above, please send the original Software only to the THE DOCUMENT FOUNDATION address specified below and include: your name and return address; a photocopy of your dated sales receipt; and a brief note describing the defect and the system on which you are running the Software. NOTWITHSTANDING THE ABOVEMENTIONED WARRANTY FOR PHYSICAL STORAGE MEDIUM SPECIFIED IN SECTION 6.1 ABOVE, AND TO THE FULLEST EXTENT PERMISSIBLE UNDER APPLICABLE LAW, THE THE DOCUMENT FOUNDATION SERVICES ARE PROVIDED TO YOU “AS IS,” WITH ALL FAULTS, WITHOUT WARRANTY OF ANY KIND, WITHOUT PERFORMANCE ASSURANCES OR GUARANTEES OF ANY KIND, AND YOUR USE IS AT YOUR SOLE RISK. THE ENTIRE RISK OF SATISFACTORY QUALITY AND PERFORMANCE RESIDES WITH YOU. THE DOCUMENT FOUNDATION, THE DOCUMENT FOUNDATION’S LICENSORS AND CHANNEL PARTNERS DO NOT MAKE, AND HEREBY DISCLAIM, ANY AND ALL EXPRESS, IMPLIED OR STATUTORY WARRANTIES, INCLUDING IMPLIED WARRANTIES OF CONDITION, UNINTERRUPTED USE, ACCURACY OF DATA (INCLUDING BUT NOT LIMITED TO LOCATION DATA), MERCHANTABILITY, SATISFACTORY QUALITY, FITNESS FOR A PARTICULAR PURPOSE, NONINFRINGEMENT OF THIRD PARTY RIGHTS, AND WARRANTIES (IF ANY) ARISING FROM A COURSE OF DEALING, USAGE, OR TRADE PRACTICE. THE DOCUMENT FOUNDATION, THE DOCUMENT FOUNDATION’S LICENSORS AND CHANNEL PARTNERS DO NOT WARRANT AGAINST INTERFERENCE WITH YOUR ENJOYMENT OF THE SOFTWARE; THAT THE THE DOCUMENT FOUNDATION SERVICES WILL MEET YOUR REQUIREMENTS; THAT OPERATION OF THE THE DOCUMENT FOUNDATION SERVICES WILL BE UNINTERRUPTED OR ERROR-FREE, OR THAT THE THE DOCUMENT FOUNDATION SERVICES WILL INTEROPERATE OR BE COMPATIBLE WITH ANY OTHER THE DOCUMENT FOUNDATION SERVICES OR THAT ANY ERRORS IN THE THE DOCUMENT FOUNDATION SERVICES WILL BE CORRECTED. NO ORAL OR WRITTEN ADVICE PROVIDED BY THE DOCUMENT FOUNDATION, THE DOCUMENT FOUNDATION’S LICENSORS AND CHANNEL PARTNERS OR ANY AUTHORIZED REPRESENTATIVE SHALL CREATE A WARRANTY. SOME JURISDICTIONS DO NOT ALLOW THE EXCLUSION OF OR LIMITATIONS ON IMPLIED WARRANTIES OR THE LIMITATIONS ON THE APPLICABLE STATUTORY RIGHTS OF A CONSUMER, SO SOME OR ALL OF THE ABOVE EXCLUSIONS AND LIMITATIONS APPLY ONLY TO THE FULLEST EXTENT PERMITTED BY LAW IN THE APPLICABLE JURISDICTION. IN NO EVENT WILL THE DOCUMENT FOUNDATION, THE DOCUMENT FOUNDATION’S AFFILIATES, THE DOCUMENT FOUNDATION’S LICENSORS OR CHANNEL PARTNERS BE LIABLE FOR SPECIAL, INCIDENTAL OR CONSEQUENTIAL DAMAGES RESULTING FROM POSSESSION, ACCESS, USE OR MALFUNCTION OF THE THE DOCUMENT FOUNDATION SERVICES, INCLUDING BUT NOT LIMITED TO, DAMAGES TO PROPERTY, LOSS OF GOODWILL, COMPUTER FAILURE OR MALFUNCTION AND, TO THE EXTENT PERMITTED BY LAW, DAMAGES FOR PERSONAL INJURIES, PROPERTY DAMAGE, LOST PROFITS OR PUNITIVE DAMAGES FROM ANY CAUSES OF ACTION ARISING OUT OF OR RELATED TO THIS EULA OR THE SOFTWARE, WHETHER ARISING IN TORT (INCLUDING NEGLIGENCE), CONTRACT, STRICT LIABILITY OR OTHERWISE AND WHETHER OR NOT THE DOCUMENT FOUNDATION, THE DOCUMENT FOUNDATION’S LICENSORS OR CHANNEL PARTNERS HAVE BEEN ADVISED OF THE POSSIBILITY OF SUCH DAMAGES. FOR PURPOSES OF THIS SECTION 7, THE DOCUMENT FOUNDATION’S LICENSORS AND CHANNEL PARTNERS ARE THIRD PARTY BENEFICIARIES TO THE LIMITATIONS OF LIABILITY SPECIFIED HEREIN AND THEY MAY ENFORCE THIS EULA AGAINST YOU. IN NO EVENT SHALL THE DOCUMENT FOUNDATION’S, THE DOCUMENT FOUNDATION’S AFFILIATES’, THE DOCUMENT FOUNDATION’S LICENSORS’ OR CHANNEL PARTNERS’ LIABILITY FOR ALL DAMAGES (EXCEPT AS REQUIRED BY APPLICABLE LAW) EXCEED THE ACTUAL PRICE PAID BY YOU FOR USE OF THE THE DOCUMENT FOUNDATION SERVICES OR FIVE EUROS (EUR 5), WHICHEVER LESS. TERMINATION: This EULA will terminate automatically if you fail to comply with its terms and conditions. In such event, you must destroy all copies of the Software and all of its component parts and cease and desist from accessing any THE DOCUMENT FOUNDATION Services. With regards to Software delivered on a physical storage medium you can end this EULA by destroying the Software and all copies and reproductions of the Software and deleting and permanently purging the Software from any client server or computer on which it has been installed. EQUITABLE REMEDIES: You hereby agree that if the terms of this EULA are not specifically observed, THE DOCUMENT FOUNDATION will be irreparably damaged, and therefore you agree that THE DOCUMENT FOUNDATION shall be entitled, without bond, other security or proof of damages, to appropriate equitable remedies with respect to your breach of any of the terms of this EULA, in addition to any other available remedies. AFFILIATE: For purposes of this EULA, an “affiliate” or THE DOCUMENT FOUNDATION means any legal entity that is directly or indirectly controlled by THE DOCUMENT FOUNDATION for so long as such control lasts. Control shall exist through direct or indirect ownership of more than 50 % of the nominal value of the issued equity share capital or more than 50 % of the shares entitling the holders to vote for the election of the members of the board of directors or persons performing similar functions. INDEMNITY: You agree to indemnify, defend and hold THE DOCUMENT FOUNDATION, its partners, affiliates, contractors, officers, directors, employees and agents harmless from and against any and all damages, losses and expenses arising directly or indirectly from: (i) your acts and omissions to act in using the THE DOCUMENT FOUNDATION Services pursuant to the terms of the EULA; or (ii) your breach of this EULA. MISCELLANEOUS: This EULA represents the complete agreement concerning this license between the parties and supersedes all prior agreements and representations between them. THE DOCUMENT FOUNDATION reserves the right, at its discretion, to change, modify, add or remove portions of this EULA by posting the updated EULA on THE DOCUMENT FOUNDATION’s website. You will be deemed to have accepted such changes by continuing to use the THE DOCUMENT FOUNDATION Services. If any provision of this EULA is held to be unenforceable for any reason, such provision shall be reformed only to the extent necessary to make it enforceable and the remaining provisions of this EULA shall not be affected. Any dispute, controversy or claim arising out of or relating to this EULA or the breach, termination or validity thereof shall be finally settled at THE DOCUMENT FOUNDATION's discretion (i) at your domicile's competent courts; or (ii) by arbitration in accordance with the Rules for Expedited Arbitration of the Arbitration Institute of the American Chamber of Commerce. The arbitration shall be conducted in Sacremento, California, in the English language. YOU AGREE THAT YOU MAY BRING CLAIMS AGAINST THE DOCUMENT FOUNDATION ONLY IN YOUR INDIVIDUAL CAPACITY AND NOT AS A PLAINTIFF OR CLASS MEMBER IN ANY PURPORTED CLASS OR REPRESENTATIVE PROCEEDING. IF YOU HAVE ANY QUESTIONS CONCERNING THIS AGREEMENT, YOU MAY CONTACT support@the-document-foundation.com. Find LibreOffice, mark it and choose "Uninstall"
Should LibreOffice has been damaged or corrupted and thereby difficult to remove we can recommend you finding help to uninstall it here.